That photo above is of my garden shed in January 2015. No joke. Well I did used to joke about it to myself and make all kinds of excuses as to why it was so cluttered. If you’d had asked me at that time what the solution was I’d have said that I needed a bigger shed. Sound familiar? This is how I took control of my garden hoarding. Though her book has been out for years many people are now discovering Marie Kondo’s brilliant organizing tips for the first time. It’s largely due to her new tv series and the fact that January is a cleansing month. Detoxing from holiday overindulgence, starting up a gym membership, and trying our best to stick to new years resolutions. A cleaner and tidier home is often on that list of things to achieve in the new year. Marie Kondo calls her method ‘Konmari’, and its brilliantly simple in helping to tidy and organize the home. I’ve been using it myself the past few years and in that time I’ve literally got rid of van loads of things. Furniture, clothes, books. So many things. Some has been recycled, some I sold online, and other things I’ve given away. What I realized through the process is that the same method can be used to tidy the garden. 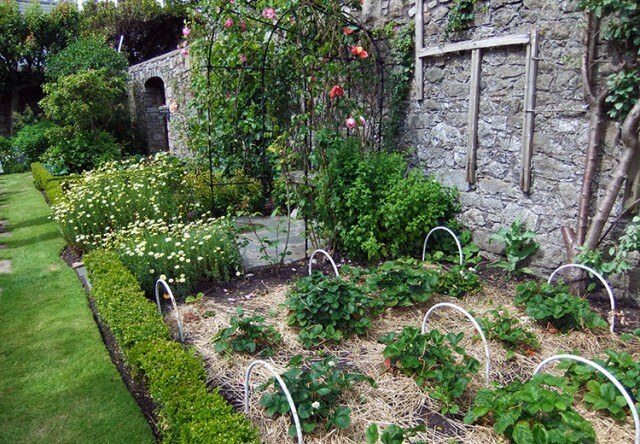 What are the benefits of organizing the garden? Using Konmari in the home is mainly about creating the ideal home you want to live in. Full of precious things that you love and free of clutter. Outdoors it takes on another tone — creating a beautiful and thriving garden that you, your family, and local wildlife can enjoy. Another reason to organize the garden is that in making efficient use of space can make you happier. Clearing your potting table gives you space to grow more seedlings. Getting rid of that old gnarly patio set gives you space to put in the hammock you’ve always wanted. Digging up a plant you don’t like gives you a place for one you love. Giving away hand tools to a beginner gardener helps spread the joy of gardening. Joy is something that Marie Kondo talks about a lot and we’ll get to that a bit later. It’s best to work as quickly as possible when using Konmari to organize. Set aside a weekend to get to work — one day for the garden store and the other for the garden itself. Stick to the steps outlined below and it will be much easier than if you were trying to organize without a method. You also need to prepare yourself to be ruthless. Achieving your goals often means sacrifice. Fortunately you’ll be sacrificing superfluous, unwanted, broken, and unused things. Organizing the garden includes going through all. those. books. If you’ve read this far then I think you’ll be able to do this step easily. Committing to tidying and organizing is a big deal. It means accepting that you have an organization or ‘too much stuff’ problem and committing to getting it sorted. What I realized in my own process is that clutter can be just as much about mental clutter as it is about having too many things. I wanted to break free. Next is actually following through. Setting aside time and not procrastinating. 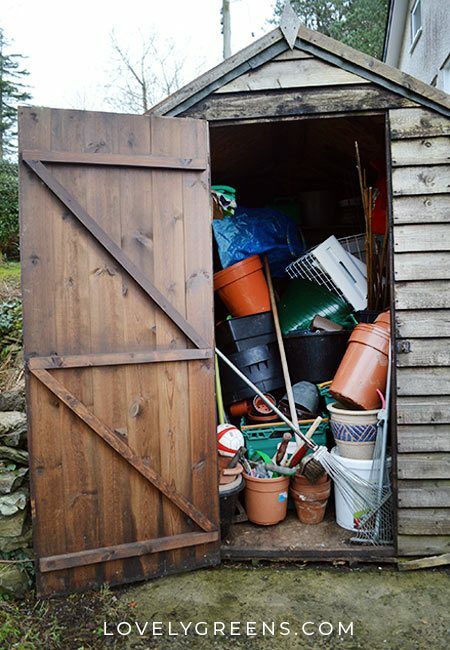 Jump right in and start sorting your shed, garage, and garden of everything that’s standing in the way of the garden you want. Which brings us to step number two. 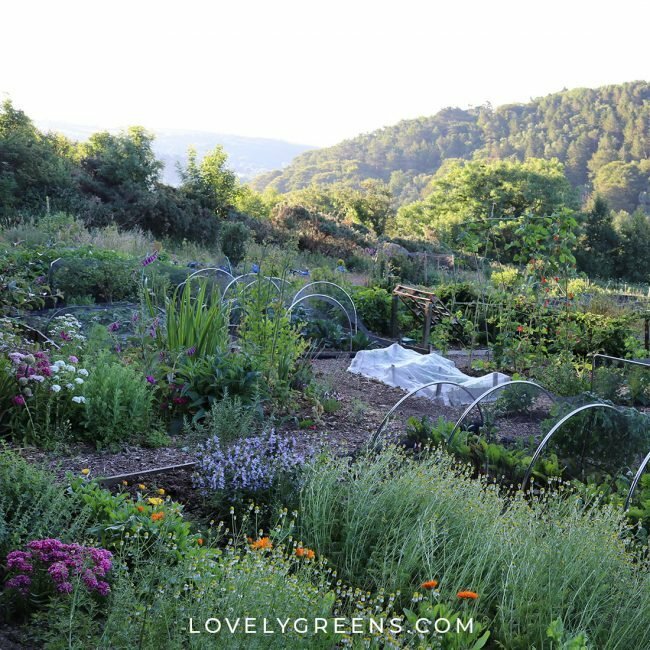 Is your dream garden a vegetable patch with rows of greens and pumpkins plumping in the sun? Maybe it’s a traditional English Cottage Garden resplendent with roses, hollyhock, and a lavender hedge. Some people might want a garden for entertaining — a fire pit, covered patio set and outdoor kitchen. Keep this in mind as you wade through all your gardening gear. Picture how your garden could look and think about how happy it would make you. Tidying and organizing what you have now will create space for your dream garden to emerge. If some of your things don’t fit in the picture, it’s time to send them on their way. Last year I picked up litter around our allotment garden. See what I collected and why it’s so shocking over here. Remember what I said about being ruthless? Discard rather than store. If you put everything ‘you might use one day’ in a box and stash it away in the house you’re just redistributing clutter. Face it, you’ll never crack open old gardening magazines from 2009 if you haven’t done so already. You also don’t need to store extra pots and trays that won’t get used. I don’t even want to get started on plants still in their garden center pots from a year ago, or TWO. Get rid of clutter any way you can but try not to store it. If you’ve had to clean out an deceased family member’s home before you know why. On an organizing tangent, have you heard of the book called The Gentle Art of Swedish Death Cleaning? It’s not as morbid as it sounds, don’t worry. Another reason that getting rid of garden clutter is important is to help wildlife. If you have so much stuff that you don’t value it as much, then it can easily be overlooked. That’s what I found when I walked around picking up litter at our allotment garden last year. Sure there were plastic bottles, but most of the litter was from abandoned gardening items. Plastic plant pots were big but even more worrying was garden netting. Left loose and unattended it can snare and kill garden birds and small animals like hedgehogs. 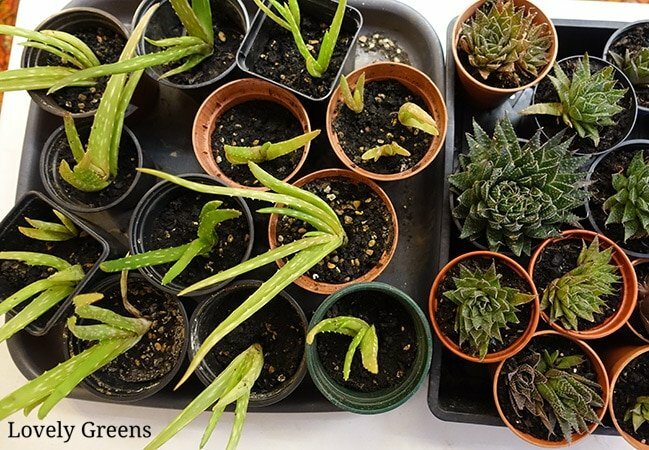 You can easily find new homes for excess seeds, plants, and other gardening items at a seed swap event. Here I propagated aloe babies from my main plant and then gave them away. What I’d do is first tidy and get rid of what you know you won’t use first. Especially anything broken or damaged. If you’re still unsure, organize all your pots and trays now and then keep track of what you use and don’t use over the course of the spring and summer. Place all your items in one box or shelving area and only take items out if you definitely need to use it. Once a pot or tray is free for use again, rinse it out and keep it in another box/area to use again. 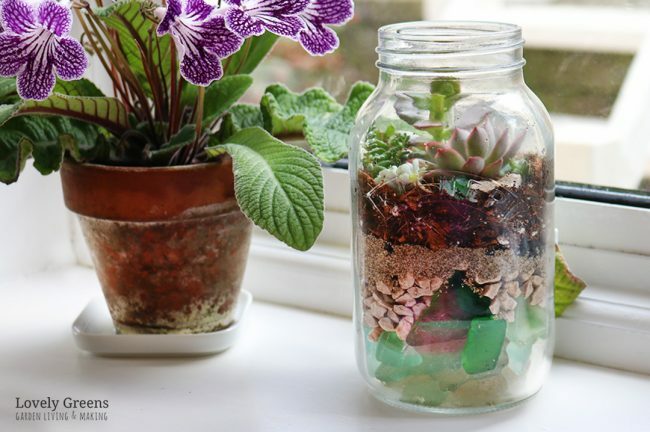 Reuse everything instead of taking from your stash you originally organized. At the end of the year you’ll probably have a massive collection of things you never end up using and just get rid of them. Recycle, give away, or whatever you choose. I’ll bet you find you pick your favourite things to use first as well. At the end you’ll have a handy collection of everything you didn’t use and don’t like as much. An important part of the Konmari method is to organize by category, not by location. We tend to tidy based on room or area but you don’t do this when you’re doing a deep cleanse. You tidy based on a list of different types of items given to you below. What you’ll do is pile everything you have of that category together and then start organizing. Choose what to keep and what to let go. Remember to be ruthless and not to store things ‘away’. You’ve got to use it, or lose it. When sorting through your items you should also think of better ways of organizing them. Keep everything of type together, for convenience, and create ways to keep track of things. Marie Kondo is the QUEEN of meticulous organization. Everything is laid out, stored, and folded perfectly, down to underwear. When it comes to garden organization I think it comes down to clutter-free sheds, gardening bags, garages, and storage solutions. 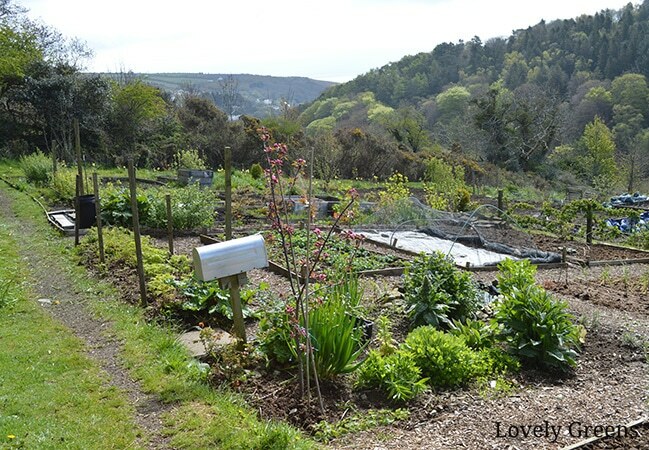 One of my favorite solutions is to keep a few of my favourite tools in a mailbox in my allotment garden. You could also hang tools from the shed wall, keep plant labels all together in a jar. The organizing ideas are endless. One of the biggest categories [of hoardings] for us gardeners is seeds. Before I had my seed box I had seeds stashed in drawers, cupboards, the glove compartment, my garden bag, various pockets, and more than a few other random places. Going through seeds can be one of the more fun and difficult categories to organize. First of all, having them all in one place is usually an eye opener! When I go through my seeds I tend to look at them several times. In the first run I quickly create a pile of ‘Would like to grow’ and ‘Don’t want to grow’. Everything in the latter category goes into a bag and I save it for our next Seed Swap. That way I can pass them on to others who actually want to grow them. 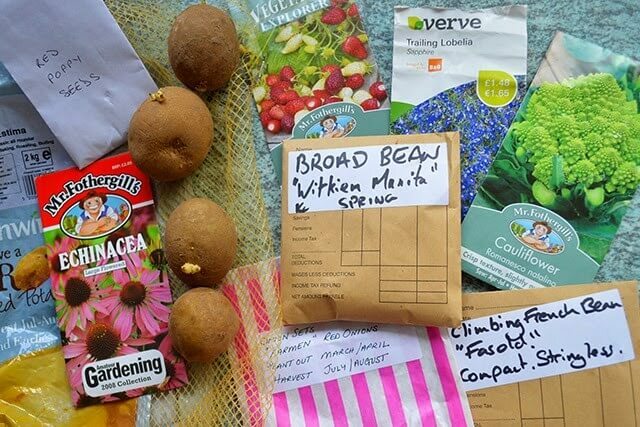 If you don’t have an event in your area, here are my tips on how to organize a seed swap yourself. I’ll go through the ‘Would like to grow’ seeds again and make decisions based on my garden plan for that year. I do look at seed expiry dates but tend to ignore them for the most part since many will still grow. The exceptions being anything in the allium family (onions, leeks), carrots, or parsnips. I tend to sow my seeds in modules first and then plant them outside after — with older seeds I just sow more at a time to ensure germination. Next comes storing your seeds in a way that works for you. You can store them based on type, by sowing date, or even alphabetically. There are all kinds of seed storage and organization ideas that you can find online but I’d like to share the one I use and another that I just came across. I use a plastic tub to store all my seeds in. 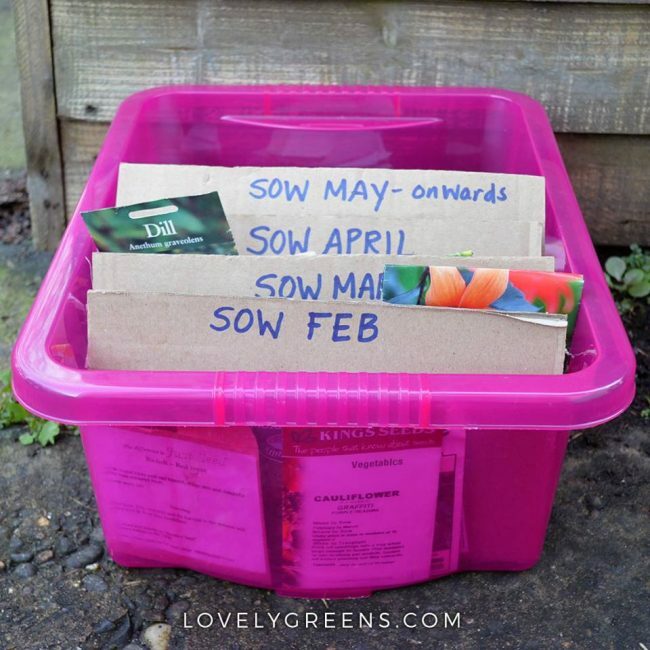 I have them organized by sowing date beginning with February, March, April, and then May and beyond. If seeds can be sown year-round or over several months I’ll move them back as I go. Each winter I go through my seeds and reorganize them into their beginning months. 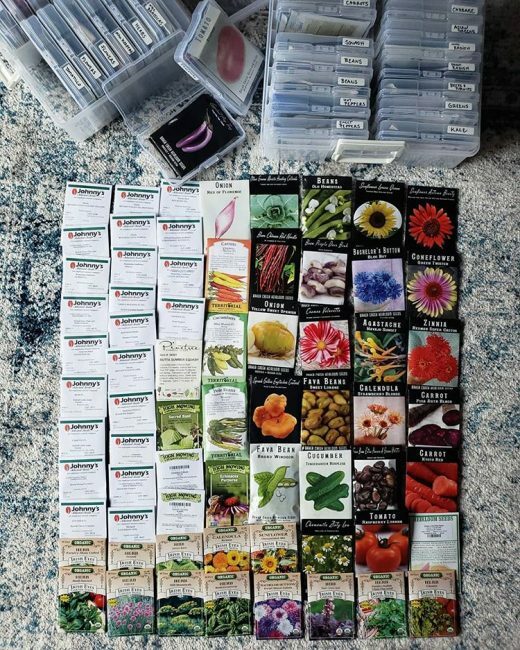 Deannacat3 on Instagram recently shared her own method of seed storage. She uses plastic photo boxes and you can learn more about how she organizes her seeds over here. The categories listed below should be followed in order. They reflect the easiest categories to make decisions on and end with the most difficult. If you start looking at other things while you’re organizing then you will get distracted. Distraction will end in wasting a lot of time, your getting bored, making yourself a cuppa, and throwing in the spade for the day. If you come across anything with sentimental value, anything at all, leave it for last. These are the most difficult to make decisions on and they are often the things that will lead you to getting distracted. Organize by category starting at the top and working your way through. 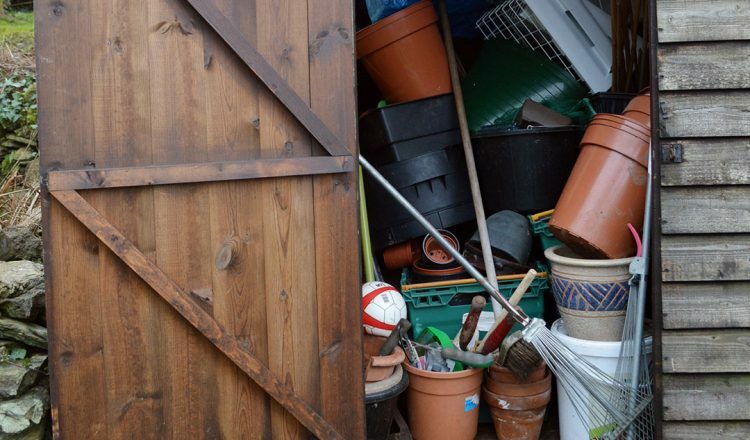 Some of the categories you’ll need to look in both your shed or storage area and in the garden. If you come across anything that has sentimental value leave it for last. Don’t get distracted looking through old letters from gardening pals or reminiscing over the garden fork your granddad left you. Originally I had gardening books much higher up the list. After hearing from other gardeners I’ve put it much further towards the bottom. 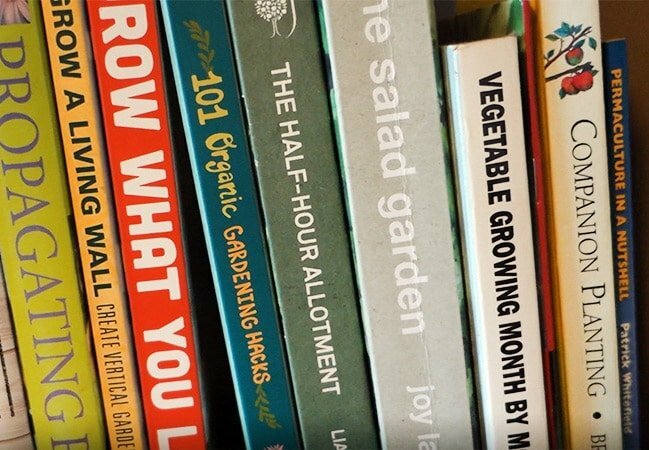 If you feel less possessive over your books then feel free to move them back up with Gardening magazines. The DIY Sea Glass Succulent Terrarium that lives in my office. Isn’t it lovely? Step 6: Does it Spark Joy? The last step in the Marie Kondo Method is one you might find a little cheesy but seriously give it a chance. Hold each item that you’re not sure about whether to keep or discard. Think about its usefulness, whether you’ve actually used it, and if it brings joy. That last part is key. Imagine putting on your favorite pair of shoes or writing with your favorite pen. If an object or tool gives you that same feeling then you should definitely keep it. If it doesn’t then you can pass it on. Marie Kondo thanks each item for its usefulness before discarding it which I think is such a great idea. For me, I can see it over time affecting how I would even bring things in to the home or garden in the first place. This last step is my own addition to the system — stop buying things you don’t need. This is something I’ve added for myself and would like to pass on to you. This is perhaps the only way to stop the clutter making a come-back after you get everything organized. If you want it but don’t need it, don’t buy it. No place to plant that on-sale azalea? Don’t take it home with you. If you have two pair of secateurs floating around somewhere but you’re not sure where they are, don’t buy another pair out of convenience. Oops, you accidentally cut the power cable with your hedge trimmer. Try to get it fixed first rather than buying a new one. I’ve added this last part because Marie Kondo doesn’t even touch on why we have so much stuff. Our culture is centered on the idea of buying stuff — we can buy what we want when we want it. It’s the American dream. Unfortunately the effects are waste, debt, environmental destruction, and clutter. We need to train ourselves not to bring unnecessary stuff home in the first place. 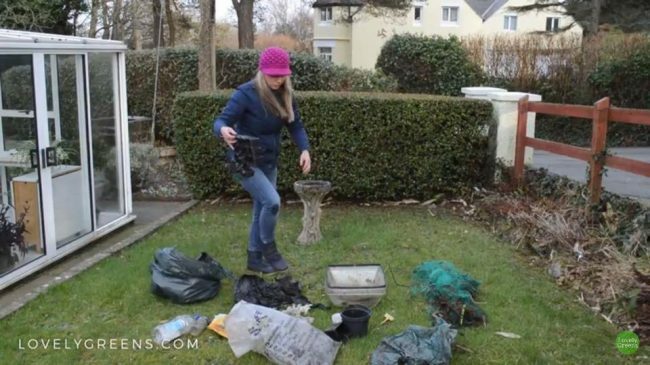 Well that’s it, my two-cents on how to use the Marie Kondo Method in the garden. I’m very interested to know if you’ve tried it yourself and what your experience has been. Do you have any further tips or ideas? If you’d like to get the book, you can order The Life-Changing Magic of Tidying Up online. 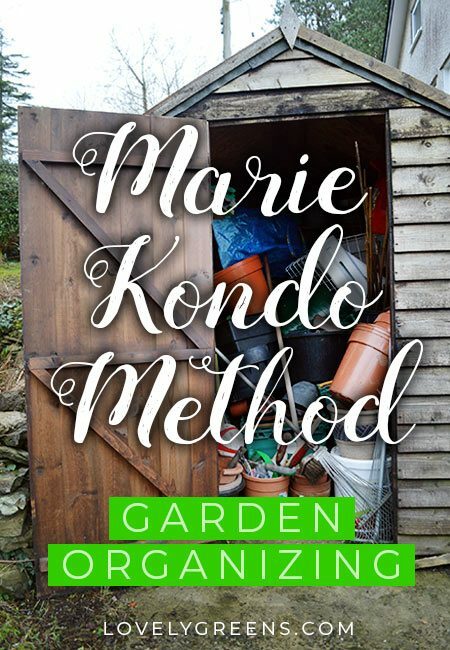 You can also see me speak about using Konmari in the garden in the video below. Lastly, you can see more of my garden over here.